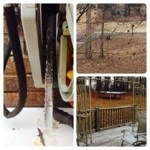 This has been a crazy winter for us central Alabamians!! After 4 days out due to ice/snow, we went back to school last week. Thursday we were dismissed early and had a beautiful, hard snow, but no accumulation. The weekend was in the 60’s. Kids were outside all weekend. Talk of snow was being tossed around, but no one thought we’d get more especially since it was 62 on Sunday. I wasn’t even off the bus yet when we got the call that school was out on Tuesday. Tuesday came and went with no issues. School was cancelled Wednesday due to the threat of a second wave coming in. All day it rained and was 40, so we thought whatever. Well, by 5:00 it was snowing and by 6:00 we had a winter wonderland! Yes, the boys took off outside to play in the pouring snow. We are out of school again tomorrow. The snow won’t last long as it warms up tomorrow, but they’ve had fun and made some memories. I do not want to make up all this missed time, but it has been fun. It was also nice to all be home. I’m sure that’s one reason we have Ben out, no one wanted kids stuck at school again! !